A rare chance to hear from three of the world's most talented and prolific graphic artists, sharing a platform for the first time to discuss their work on album covers. Dave McKean has created over 150 stunning sleeves in his career - for bands such as Fear Factory, Front Line Assembly and Skinny Puppy – while Vaughan Oliver rose to fame through his otherworldly masterpieces for 4AD bands The Cocteau Twins, This Mortal Coil, Pixies and countless others. They are now joined by Andy Vella, whose well-known work with The Cure is featured in the new book Obscure. Update (11/05/14): Reminder that the auction is on Sunday, Nov. 9th at 7 pm eastern. Update (10/13/14): Some new photos. From Phaidon (Thanks @caIigari): There’s a fine art to the charity auction. Pairing a good cause with worthy goods and suitably talented contributors is no easy feat. Yet War Child USA appears to have pulled it off. The philanthropic organisation, dedicated to helping children caught in regions of conflict, has taken 16 Canadian Carparelli guitars and had them customised by a series of famous names from the music, film and art worlds. Sterling Ruby, Iggy Pop, Michael Stipe, Gus van Sant, Shepard Fairey, ex-Cure guitarist Pearl (formerly Porl) Thompson, Muse frontman Mat Bellamy, the artist Ginger Gilmour (ex-wife of Pink Floyd's Roger), Canadian painter Michael Adamson, and British artist and filmmaker Sam Taylor-Johnson have all reworked an instrument. Rumor: More festival shows next year? "Well, well, The Cure will play some festivals next summer..."
Yeah, I know, here we go again. But this Spanish website has a release date of Nov. 30th, 2014 (a Sunday?) for '4:14 Scream'. I wouldn't put too much faith in this just yet. Now that the Riots are over, maybe we can get an update from Robert? 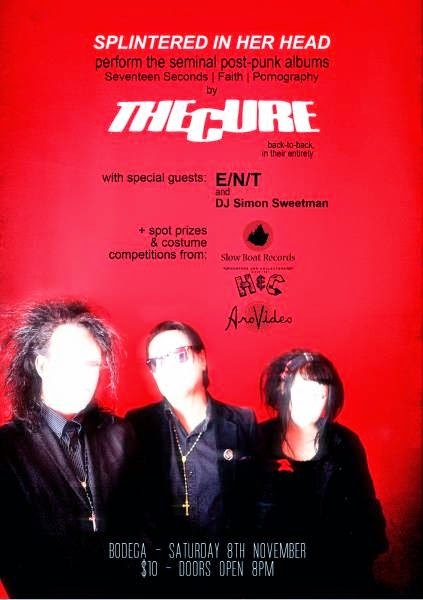 The Cure play London on Dec. 21st, 22nd & 23rd! Update (Nov. 7th, 2014): 3rd show added on Dec. 23rd! The Cure return to Hammersmith Eventim Apollo for a clutch of Christmas concerts on Sunday 21 and Monday 22 December 2014. 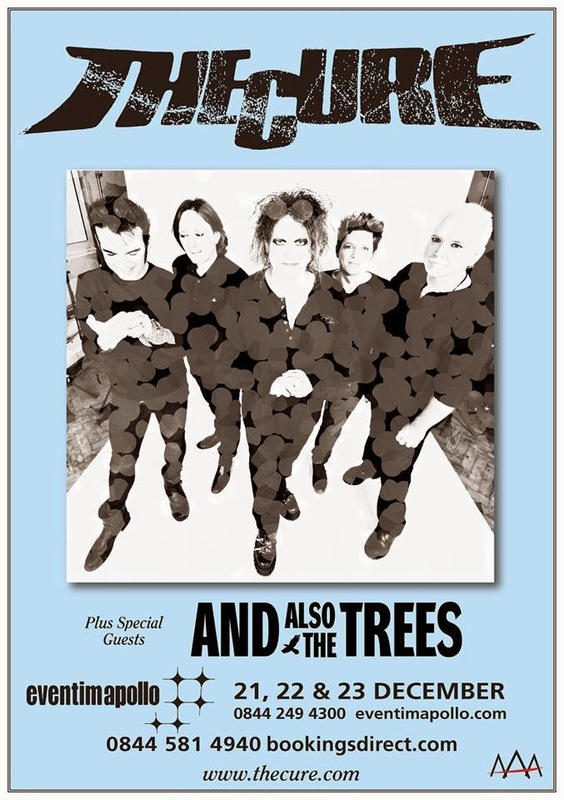 Reprising the role they performed at the same venue 30 years ago each concert will also feature And Also The Trees as support.